Safety signs indicate an area with asbestos in the Parliament. Scaffolding surrounds a section of the Houses of Parliament in London in September 2016. 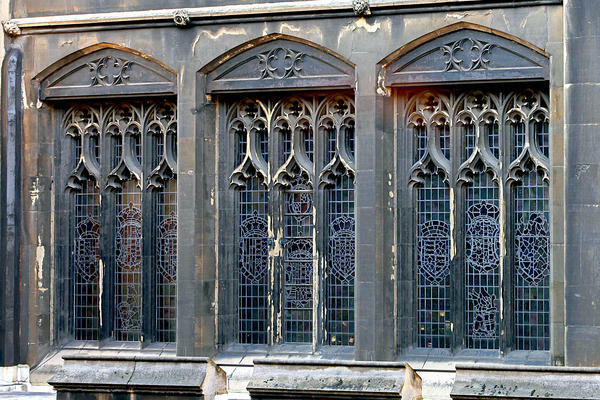 Palace windows show signs of age and decay. London Bridge isn't falling down, but Britain's Parliament building — which sits along the River Thames and includes Big Ben — needs a ton of work. U.K. lawmakers are now analyzing a massive rehab plan that will cost billions of dollars and could force legislators to work somewhere else for years. The options run the gamut. Doing the minimum amount of work to the complex, with lawmakers remaining inside, would take 32 years and cost more than $7 billion, according to an independent assessment commissioned by Parliament. Moving legislators into temporary accommodations one house at a time would cut construction time to 11 years and slash the price tag to a minimum of $4.9 billion. Moving both the House of Lords and the House of Commons out of the complex at the same time would further reduce renovation time to six years, at a minimum cost of $4.4 billion. "What we want to do today is nail down the numbers on the costs," said Meg Hillier, a member of Parliament with the Labour Party, during a hearing this week on the proposal, "because it's a huge task to manage." The amount of work to fix the Palace of Westminster, as the complex is formally known, is staggering. The problem isn't the structure itself, most of which was built after the fire of 1834 and remains sound. It's the guts of the complex, systems which include more than 700 radiators, 4 miles of hot water pipes, 7 miles of steam pipes and about 50 miles of telephone cables. Most of the infrastructure dates from after the end of World War II and is either a jumble or in decay. On a recent tour of the basement, engineer Andrew Piper pointed out potential hazards, including an area where gas lines run next to high-voltage lines. "No one's had the opportunity to replace all these services in one go and come up with something that's sensible," said Piper. "Since the 1950s, it's just been adaptation, adaptation." The U.K. government has put off fixing all this because of the expense and disruption it will cause, most likely forcing lawmakers to work elsewhere in Westminster for years. "Sometimes politicians — and I am one — are not very good at making swift decisions," said Chris Bryant, a member of Parliament from Wales with the Labour Party and a member of the committee that drafted the renovation proposal. No one questions fixing the Parliament building, which ranks with the Eiffel Tower and the Taj Mahal in terms of global recognition. But some members insist on scrutinizing the cost, given the whopping price tag. Bryant said the project is expensive because of its size and difficulty. For instance, he says, the Palace of Westminster has more than 4,000 windows that need work and the complex is riddled with asbestos. Some of the infrastructure looks ancient, including a giant, silver-colored tank that pumps sewage into London's sewer system. Embossed on the tank is the date it was made, 1888, back when Jack the Ripper was prowling Whitechapel. At first, Piper didn't believe it, but then he checked the House of Commons library and found the tank was indeed well over a century old. Parts of the ornate exterior also need a face-lift. The palace's Cloister Court is one of the few surviving sections of the complex dating to medieval times. Today, though, it's cordoned off for safety reasons, because some parts of the stone façade are crumbling and other parts look like they've been melted by acid rain. No matter how much the rehabilitation of the Palace of Westminster ultimately costs, the project will take years to accomplish. For Piper, the engineer, it will be a labor of love. "I came here for this building," he said. "Every day you see it on TV, where it's on the news, it's on an advert, you feel connected to it and you feel it should be saved." It turns out London Bridge is not falling down. 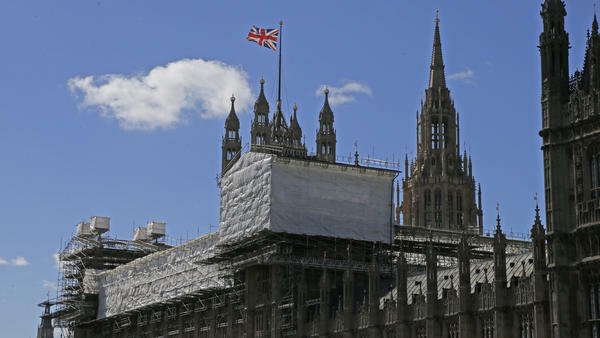 But Britain's historic houses of Parliament, including Big Ben, need a ton of work. U.K. lawmakers are now analyzing a massive rehab plan that could cost billions of dollars. It could also force legislators to work somewhere else for years. Here's NPR's Frank Langfitt in London. FRANK LANGFITT, BYLINE: No one disagrees that Parliament needs renovation. But as Meg Hillier asked, for how much? Hillier's a member of Parliament with the Labor Party. MEG HILLIER: What we want to do today is nail down the numbers on the costs. It's a huge task to manage. LANGFITT: To get a sense of just how much work lies ahead, I recently toured the iconic building along the Thames. 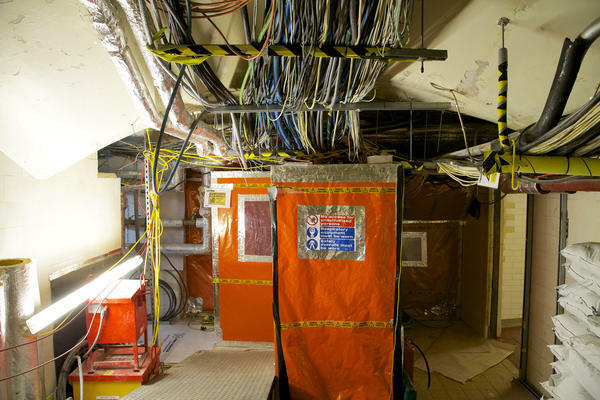 ANDREW PIPER: So this is the basement for the Palace of Westminster. LANGFITT: This is Andrew Piper. He's an engineer, and he's working on plans to renovate the Palace of Westminster. That's the formal name for the Parliament building. PIPER: And what you're seeing here now is all the pipes and wires, you know, 240 miles' worth of cabling that keeps the palace operating, you know. LANGFITT: Piper says most of the systems were built after World War II. Today, some are downright dangerous. PIPER: Big steam pipe work, big pipe work for cooling, gas, high voltage. Ideally, we would not want gas running alongside our high-voltage. LANGFITT: That seems a recipe for disaster. CHRIS BRYANT: Well, that's basically the theme of our reports. LANGFITT: That's Chris Bryant. He's a member of Parliament from Wales, helped draft a plan to completely rebuild the systems, which, as Piper points out, are a complete jumble. PIPER: You know, no one's had the opportunity to replace all these services in one go to come up with something that's sensible. Since the 1950s, it's just been adaptation, adaptation - 'cause this is all old. And it all needs to be replaced. LANGFITT: Why has it taken so long to address the problem? BRYANT: Well, because sometimes politicians - and I am one - are not very good at making swift decisions. LANGFITT: Bryant says the cheapest and quickest way to fix Parliament will cost more than $4 billion. BRYANT: It's expensive for lots of different reasons, one because there's a great deal of work to be done, secondly because it's a very, very large building. There are 4,800 brass windows that have got to be dealt with. LANGFITT: And the place is riddled with asbestos. Most of the systems here date to the '50s. Some are even older, like the giant silver-colored tank Piper shows us buried deep in the building. PIPER: That was installed in 1988. LANGFITT: Back when Jack the Ripper was prowling Whitechapel. The tank pumps sewage into London's sewer system. LANGFITT: A loud bang comes out of nowhere. PIPER: We shouldn't run. But maybe we won't spend too much more time down here 'cause they do leak. I mean, they're 130 years old. What do you expect? LANGFITT: While most of the work focuses on the guts of the building, parts of the ornate exterior need a face lift. Piper leads us up onto the roof. We look down into an enclosure that's been blocked off for safety reasons. PIPER: So this is a 16th century cloister courtyard. Stone features are physically crumbling, really down to the environment, you know, pollution, you know, every single one of those windows there is a bronze window. You know, these windows were hand-made. To replace every one of these windows and bring them up to a watertight standard is a huge task in itself. LANGFITT: I mean, all this stuff look like it's melted from acid rain. And then all of this stuff here is all torn to bits. PIPER: No, your assessment's fair. LANGFITT: Rebuilding the courtyard will be a massive task, which makes you wonder, why would Piper sign up for something that's so difficult and will take years? Back inside, he explains. PIPER: I came here for this building. Every day you see it on TV, where it's on the news, where it's on an advert. You feel connected to it. And you feel it should be saved. LANGFITT: Now it's up to the members of Parliament to decide just how to do that and how much money to spend. Frank Langfitt, NPR News, London. Transcript provided by NPR, Copyright NPR.